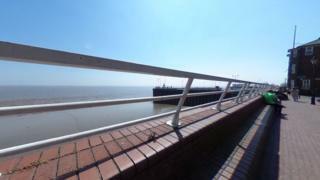 Positive messages are to be played over speakers on the pier in Hull as part of a suicide prevention campaign. The You Are Not Alone project has been designed by young people aged between 12 and 22 from the city. The participants chose significant locations to them to broadcast the messages and poems hoping to break the taboo of talking about suicide. It follows a similar project by the group that played messages on the nearby Humber Bridge. Dagmara Podsiadlo, 22 one of the group said: "From personal experience, I know that I would have needed this if I ever felt low, depressed or had suicidal thoughts. "Hearing these messages could save my life, not just in the moment, but inspire me to help myself by seeking aid from those around me and inspire me to help others as well." Sarah Blackie, of Papryus a charity dedicated to the prevention of young suicide, said the project "was one of the most powerful initiatives we have seen". The charity is encouraging other cities to use the idea developed by Headstart Hull, a Big Lottery-funded project to improve young people's mental health. Gail Teasdale, of HeadStart, said it had received "really good and positive feedback" on the impact of the Humber Bridge message. The broadcasts through three speakers at the pier are to run for a month from Monday until 10 October. The speakers are due to be installed in other locations later in the year, said Hull City Council.